The Danny O’Brien-trained Fashion Black got favourite backers off to the perfect start by winning the $70,000 New Year 0-82 Handicap (1700m) for fillies and mares at Flemington on Saturday. However supporters of Fashion Black wouldn’t want to endure it all over again. Settling in the one-one shortly after the start, Pearly Kate and Sensational Report led the race at only a muddling tempo forcing Dwayne Dunn to hook Fashion Black wide and drive her forward into the lead. 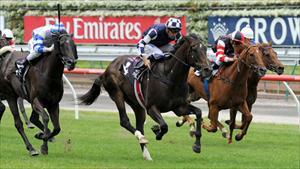 The pace remained pedestrian and it was expected that Fashion Black would accelerate clear for a painless win. However Fashion Black only kicked a length clear with 350 metres remaining and then layed out in the straight forcing Feel Like Dancing wide but managed to hold sway on the line. Fashion Black defeated Feel Like Dancing by a half length with Comocean a further three-quarter-lengths away in third. “I let Sally (Wynne) come around (aboard Sensational Report) and she steadied and then I let Darren (Gauci) come around (aboard Pearly Kate) and he really put the brakes down,” Dunn said. O’Brien reassured all that were within distance post-race that she was better than the nature of win suggested. “She looks a lot better in a race where they put tempo on and she can get off the back of things and chase them down,” O’Brien said. “Today was the old story of Victorian racing, something gets to the front and all they wanted to do was stop. Dwayne made a move and having nothing to chase was never going to suit her but she did really well. “She’s a filly that’s going places and she’ll actually look better in a stronger sort of race where there is genuine pressure and she can actually use her stamina,” he added. Fashion Black will next run in the $70,000 Jezabeel 0-89 Handicap (2000m) for fillies and mares at Flemington in a fortnight. Should she indicate to O’Brien that she can get over further ground, a tilt at the $300,000 Mornington Cup (2400m) may be on the cards. A last start winner at Flemington over the mile, Fashion Black has now raced nine times for four wins with prizemoney in excess of $110,000.